A Scientist's New Job: Keeping The Polar Bears' Plight Public Global warming is pushing species like the polar bear to the brink of extinction. It's not a typical conservation problem, so one government biologist discovered the best way he could help save the great white bears was to quit his job. The Endangered Species Act, which turns 40 on Saturday, helped bring back iconic species such as the wolf, grizzly bear and bald eagle, after hunting, trapping and pesticides almost wiped those animals out. But a very different kind of threat — global warming — is pushing some species like the polar bear to the brink of extinction. One government biologist discovered the best way he could help save polar bears was to quit his job. Several years ago, the polar bear was under consideration for placement on the endangered species list. Biologist Steve Amstrup's mission was to lead a group of scientists in assessing the outlook for the great white bear. 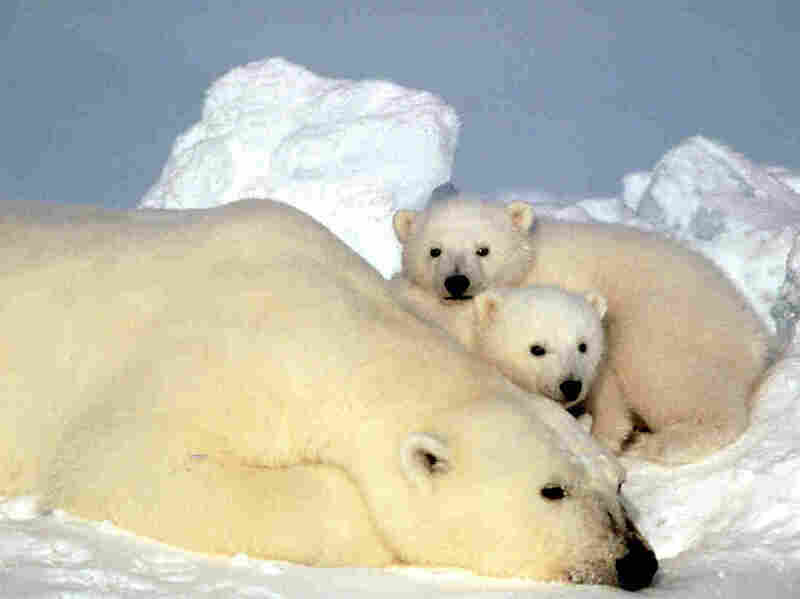 Amstrup headed the government's polar bear research for many years, but the group's dire assessment surprised even him. "By the middle of this century, we would probably lose two-thirds of the world's polar bears — including those I had been studying for 30 years in Alaska — if we didn't change our ways," Amstrup says. The scientists showed that the sea ice that polar bears live on and use as a platform to hunt seals was shrinking as global temperatures rose. The threat was clear, and the government put bears on the endangered species list five years ago. But, Amstrup says, "It was also clear that this was not a typical conservation problem." The government couldn't restrict hunting, ban a pesticide or create a reserve. Doing what it normally does wouldn't save the polar bear. Amstrup concluded the bears' only chance was for people to seriously reduce their greenhouse gas emissions. "So I decided that, you know, I need to get this word out," he says. Getting the word out meant leaving the job he loved with the U.S. Geological Survey. For three years, Amstrup has been chief scientist with the conservation group Polar Bears International. He still does field research, but his main focus is teaching people about polar bears' precarious position. "They live on a habitat that literally melts as temperatures rise, and because of that, they're a really good symbol of the changes that we're making in our atmosphere and in our world," Amstrup says. He spends every fall in northern Canada, where polar bears hang out on land waiting for the sea ice to form again. "They're getting hungry and they're anxious to get back on the ice and resume catching seals," Amstrup says. Amstrup and other scientists use special vehicles called tundra buggies — "giant school bus-like things with giant tires," Amstrup says — to take tourists out onto the tundra and see the bears up-close. The scientists also produce live tundra webcasts for school children and anyone else who's curious about polar bears. "All the while, polar bears are kind of roaming around in the background," he says. This year, the ice was frozen longer, so he says the bears seem to be in pretty good shape. "But over the last two or three years, my impression has been, 'Man, there's a lot of skinny bears out here.' "
On average, the sea ice in the Hudson Bay is frozen about a month less per year than it was 30 years ago. Amstrup says bears don't eat much on land, so they lose about 2 pounds of body fat every day they're off the ice. "They're 60 pounds lighter now than they might have been at this time of year 30 years ago," he says. He's disappointed by how little political reaction there's been to all that science has shown about the affects of global warming. "We came up with all this compelling evidence," Armstrup says. "It's really, really clear we have a problem. And yet we see very little action on either the national or even the international scale." The sea ice is melting even faster than scientists' models say it should be; it's not clear how much time polar bears have.